Delta uses a version of this in iCrew labeled the "html" flight plan. My version has a couple of more bells and whistles and Delta's version is easier to create. iCrew version of the html flight plan. There is a new version of the html flight plan that is now in testing. Not that I am not interested, but it is too late for me to act on any feedback that you might. If you want to see what is coming, translate an example, etc, I have more information here: http://johnfbell.com/iCrewFP_code_test.html. Log into Deltanet first, https://deltanet.delta.com, then use the links below. This version uses the embedding feature of online Excel in OneDrive. You should be able to interact with it directly in your browser. Unfortunately, it does not always work and I have not figured out why. The trick to this web version appears to be to log into DeltaNet first and then click on the link below. I will ignore any requests to share the file. It is not that I do not want you to have the information. The problem is that if I grant the request, you can also corrupt the file. iPad: This will work on the iPad, but it is tricky. 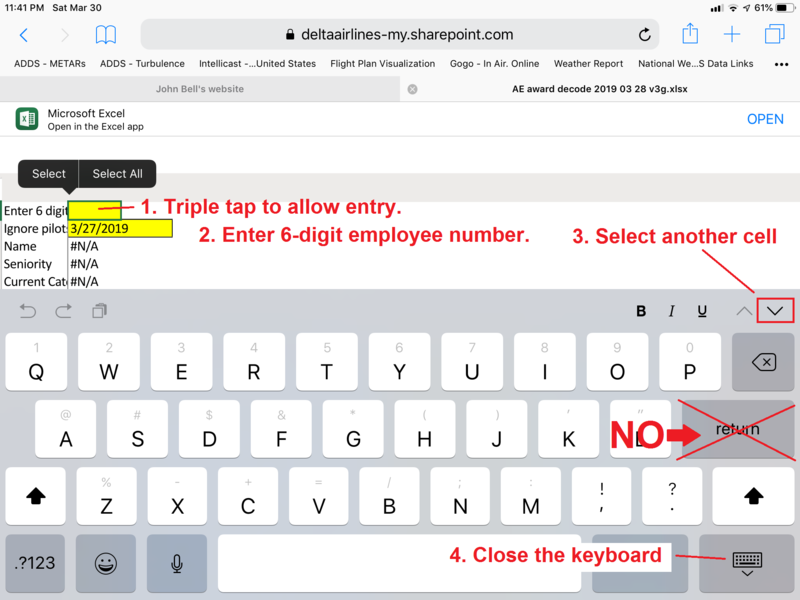 It appears that the best way to select within the file is to triple tap on the cell to enter your 6-digit employee number. The next trick is to move out of the cell to register the entry. DO NOT use Return. Use the down arrow in the upper right corner of the keyobard instead of Return. Lastly, you need to close the keyboard. Link to a picture of the process. Downloadable version of the Excel file. This link will open in your browser, but will be static. Click on the "..." in the upper right corner after the link opens and choose "Download." click here to see picture You will then need to open the downloaded file in Excel to interact with it. The pdf summary allows you to see just the results of the AE. Each pilot, with the exception of bypass pilots, is listed once for the category that he is entering and once for the category that he is exiting. Bypass pilots are only listed in their current category since they are not really moving. This allows you to get an idea of what happened in each category without using Excel. You might also consider two more detailed sources of analysis. The ALPA site will be updated soon after Delta publishes the projected category list. Curly Culp should be updated relatively soon after the award. Delta ALPA Pilot Dashboard This is generally updated to reflect the latest projected category list and there is some lag after the award due to the wait for the projected category list. However, this offers more detailed analysis than my Excel version of the projected list. Curly Culp's Widget Seniority Curly usually updates his site quickly after the award and has a lot of detailed information. Note that the above link will require you to sign into Deltanet and the files are not available publicly. While I am flattered by the fact that many people find these useful, I would highly encourage that you learn about the analysis tool in the PBS Web App. More details are available in the PBS Gouge or the YouTube videos produced by the PBS Committee. Both are linked from http://pbshelp.info/delta. FAR 117 calculator in Excel. This uses a copy and paste of the pairings from iCrew to calculate some of the FAR 117 cumulative parameters. HTML version of the Reserve Pay Calculator optimized for the iPad. note: This should work on any computer. This is a tool that allows you to switch days from X to R and see how many work days you have used in a row, X day blocks, etc. This was created to help answer e-mails with reserve questions. This may not cover every scenario and is offered on a use at your own risk basis. enario and is offered on a use at your own risk basis. If you have Office 365 with Excel on your iPad: Use the normal link. Use the square with an arrow comming out icon near the URL window to send the file to Excel. If you do not have OneDrive or Office 365: Use the "online" link. This should work in Safari. However, selecting cells with pull down menus such as the month can be problematic. I find the trick is to do a double tap, but continue to hold your finger down on the second tap until the menu appears. If you have OneDrive installed, but do not have Office 365: I have not found a good solution other than to find another device or computer. I have an Excel workbook that allows you to create flash cards in an html format. I have an example below of for 777 Memory and Limitations. I also have an example as well as a blank version of the Excel file so that you can create your own. Version of Workbook with 777 questions as an example.